Does the operation require a general anaesthetic? The aims of otoplasty are to reduce the prominence of the ears and to create a more natural shape to the ears. This surgery can be performed in both children and adults. The aims of otoplasty are to reduce the prominence of the ears and to create a more natural shape to the ears. This surgery can be performed in both children and adults. The commonest indication for surgery is prominence of the ears caused by a poorly developed folding pattern of the cartilage. Usually the ear has a poorly developed anti helical fold and this needs to be created to reduce the prominence of the ears. The surgery can also be performed under general or local anaesthetic alone. Patients having local anaesthetic alone will only experience a few seconds of pain during the administration of the anaesthetic before it becomes effective. It is possible to block the entire ear so that patients do not feel any pain during the procedure. Dr Belt has performed this procedure under local anaesthetic on patients as young as 16 years old and patients tolerate the procedure well. Dr Belt employs the technique described by Dr David Gault in London. He is regarded as one of the premier ear surgeons in London and as a consequence sees a lot of complications of otoplasty and specifically designed this technique to reduce the large number of complications he was seeing from surgery performed by other surgeons. Dr Belt has observed and been mentored about this technique by Dr Gault. The advantage of the Gault technique is that the front part of the ear is not violated. This is a much safer procedure which minimises the potential risks of infection, skin loss and the possible production of a cauliflower ear. The ear is analogous to a sandwich. The skin of the ears on the front and back surfaces is like the “bread” of the sandwich. The cartilage acts as the filler for sandwich. In addition, there is a vascular layer analogous to the butter of the sandwich that lies between the skin and filler on both front and back surfaces of the ear. A thin layer of skin is excised from the back of the ear to allow exposure to the cartilage. The Gault technique uses the “butter” layer to raise a flap of (fascial) tissue from behind the ear. Permanent sutures or stitches are placed into the cartilage behind the ear, to create and improve the anti helical fold of the ear and reduce the prominence. These are then covered with a double layer with the (butter) fascial flap and then the skin placed over the top. Dr Belt has been employing this technique for 10 years. The results are equal if not superior to the cartilage scoring techniques and, as described above, the potential complications are much reduced. In older children and adults, it is possible to perform the surgery entirely under local anaesthetic. This is done by blocking the main nerves that supply sensation to the external ear. Patients undergoing the procedure will still be awake and can hear the operation being performed. For this procedure and overall comfort, I would recommend a general anaesthetic administered by a specialist anaesthetist if you feel that you wouldn’t be comfortable being awake during the procedure. 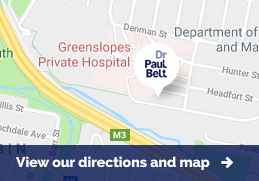 Dr Belt is now performing an increasing number of procedures under local anaesthetic alone. The risks will be discussed with you in detail before you consent to the operation. The risks can be broken down into general risks associated with any operation, and those specific to otoplasty. General operative risks include anaesthetic complications, bruising, bleeding, infection, wound breakdown and abnormal scarring such as keloid scarring. Specific complications include swelling and bruising to the ears, wound infection, bleeding from the wound and from under the skin, collections of blood or fluid under the skin, pressure from the dressings on the ears, tenderness or temporary numbness to the ears, skin surface irregularities, loss of the corrected shape, recurrence of the prominence and the need for revisional surgery. Rebates are available through Medicare and Private Health Funds. Please contact Dr. Belt’s rooms for a personalised quote and for further information to be sent to you. Most cases are performed as a day case. No drains are used. A bandage is placed around the ears and remains in place for one week. At one week these dressings are removed. Some slight bruising and swelling is normally present at this time but should settle over a couple of weeks. The skin stitches (sutures) behind the ear are not visible after the bandages are removed. The sutures are removed at 2 weeks. Dr. Belt encourages you to wear a tennis sweat band over your ears at night for six weeks. You should avoid wearing caps for three months. The operation involves making a small excision of skin behind the ear. A flap is then raised from the tissue which lies between the skin and cartilage on the back of the ear. Two layers of permanent sutures are then employed. The first reduces the prominence of the ear by pulling the ear closer to the side of the head (concho-mastoid). The second set of sutures uses a series of horizontal mattress sutures to create the deficient anti-helical fold. The sutures are then covered over using initially the fascial flap that was raised and then secondarily the skin layer is closed over the fascial layer. The wounds are dressed using dressings that help shape the ear and these are left in place for approximately one week.